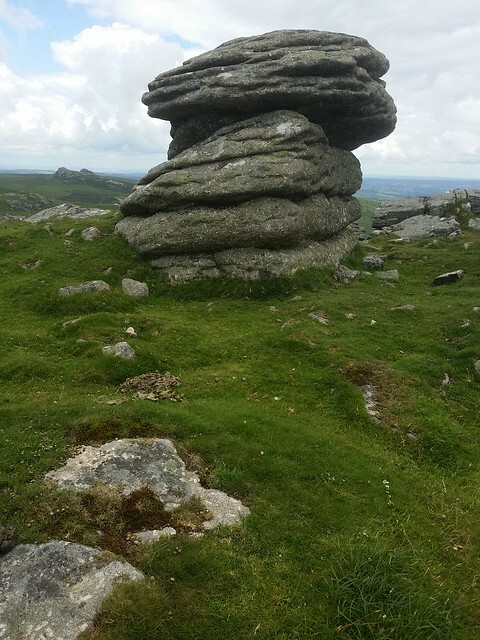 It was with some trepidation that I began another outing in the Haytor area. This time there was the potential of twelve bags, ten of which would be first time visits. 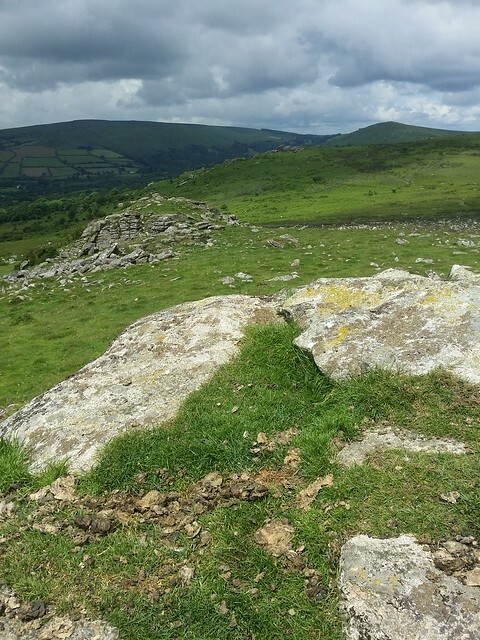 One tor was always going to be a real challenge and the route I had planned was an erratic affair that involved some back tracking and plenty of reliance on good terrain. It proved tougher than I had imagined. 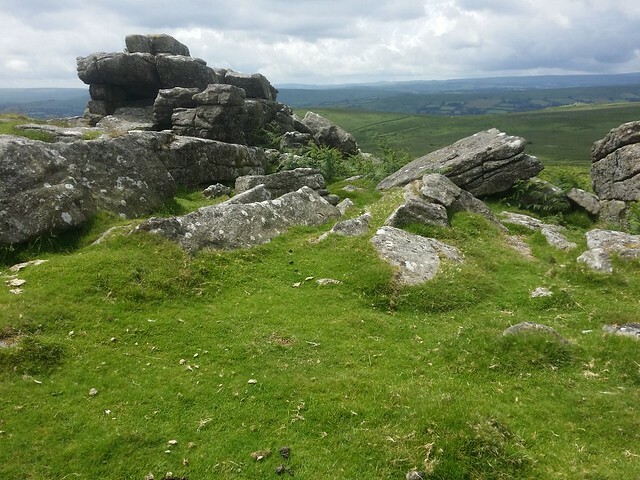 I parked up at the car park on the B3387, high to the east of Widecombe on the Moor, north of Top Tor. The day was cool but sunny, perfect walking weather. 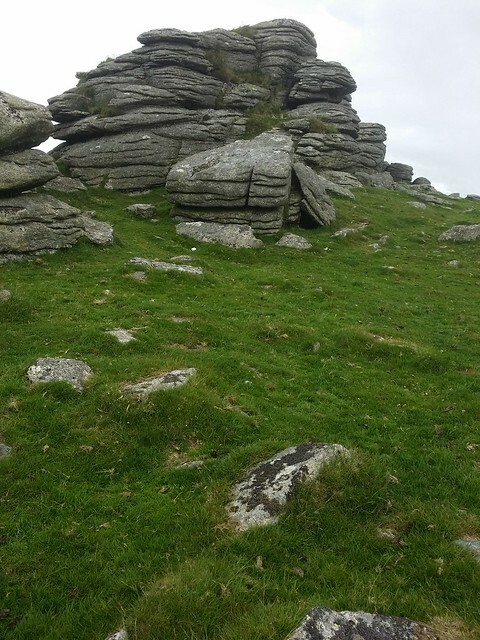 I wandered over to Bovey Rock. On previous walks, this has been the last tor of a long day, and visits were snatched encounters enroute to the car. 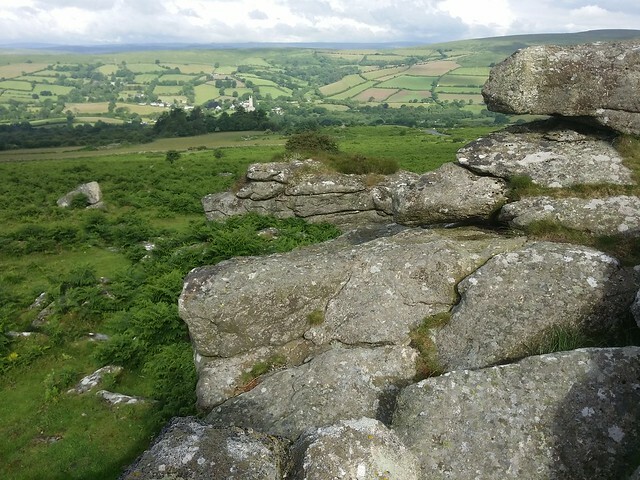 Now I took a better look and I liked; consisting of two main outcrops with a lovely view of Widecombe below. 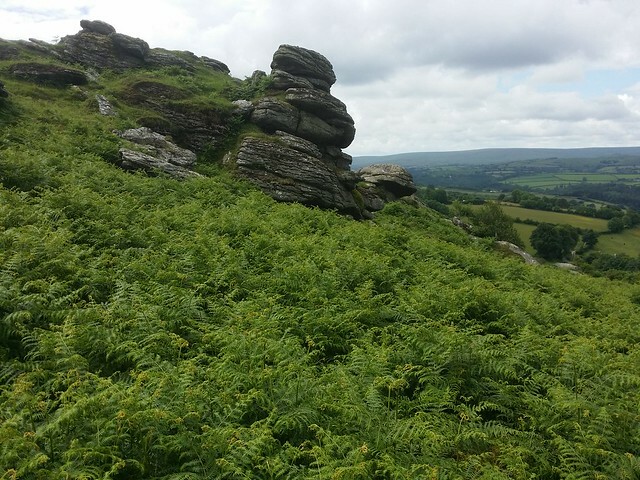 I could see Hollow Tor (Widecombe) further down the hillside, to the south, but I couldn't see Shovel Stone. The bracken had taken hold of the land and for all I knew it could be engulfed, so I headed for Hollow, keeping an eye out. I got a pushover notification telling me I had bagged the missing stone but I had not seen it so I retraced my steps to investigate further. I stopped to check my notes and saw that Ken Ringwood had a different coordinate to the one Social Hiking had; It's an occasional issue that occurred when we converted the Ordnance Survey Grid References to metric coordinates needed for the website, but it is one that is being corrected as each tor or rock is bagged. I saw Shovel Stone further up the hill and made my way up to visit. 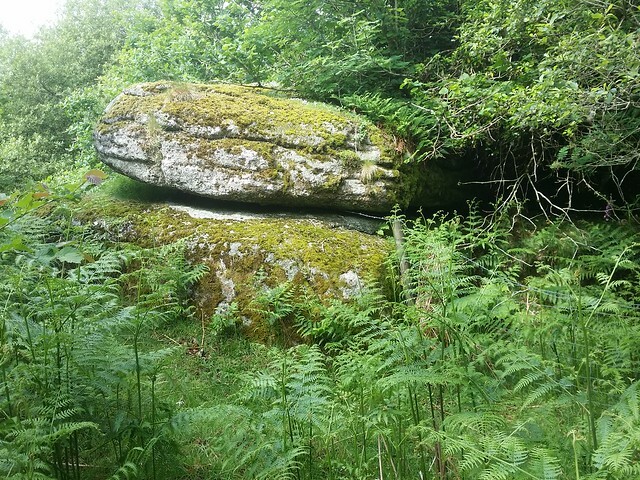 It's a fairly insignificant looking rock, notable only because it was once a boundary stone. Still, it possessed a nice patch of alpine wild flowers on its side, that served to whet my appetite for a trip to Zermatt, Switzerland, the following week. Of course, it also had those views! 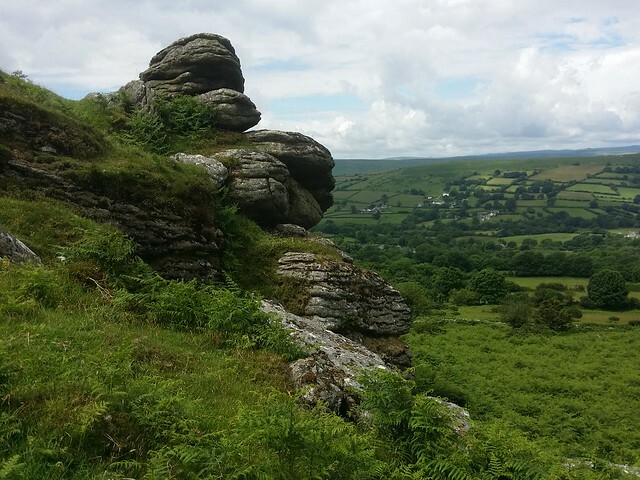 Next was Hollow Tor (Widecombe). Similar to others in this area, This tor is extensive, creeping down the slopes. It is a very photogenic tor, from all directions. 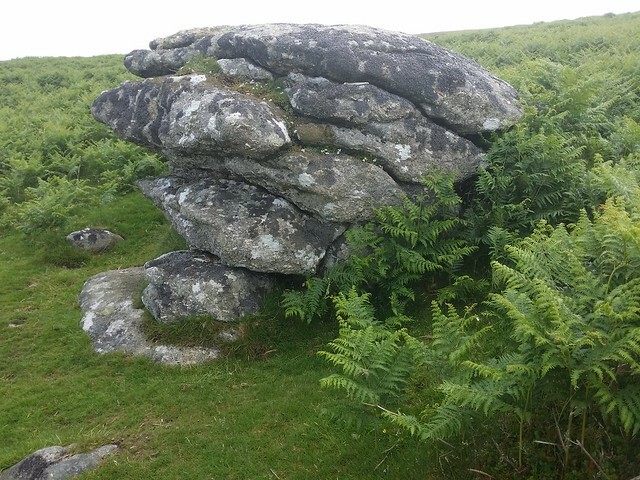 I peered down the hill for some hint of Rugglestone Rock. 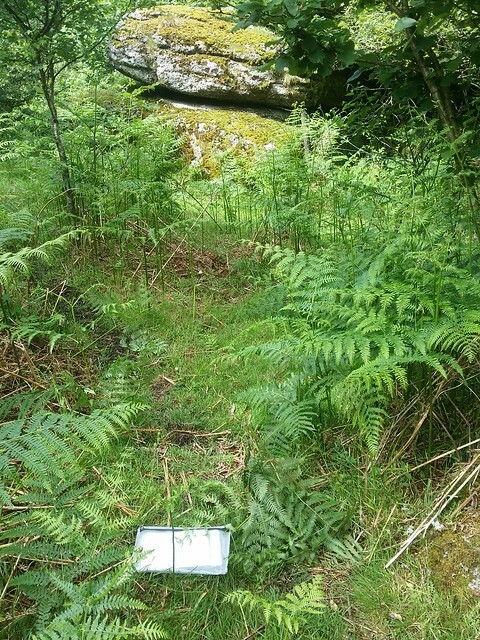 What I saw was a thick band of bracken followed by an area of obvious mire and then woodland. It's always a bit of a pain to lose height on a diversion but it had to be done. 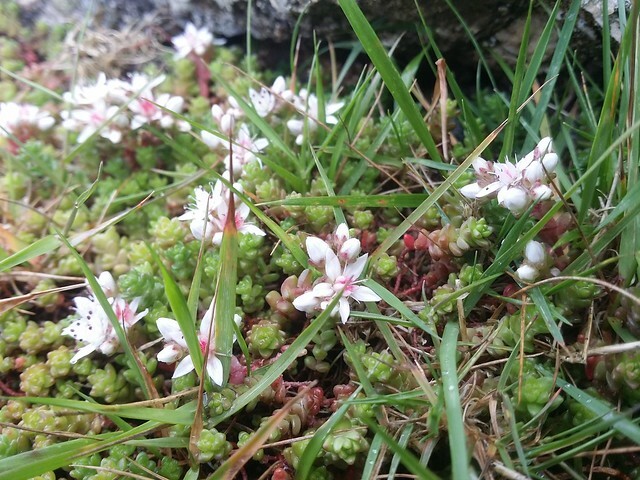 The ground beneath the ferns was good, but as they began to thin, the cotton grass began to appear and my boots began to take on water. The woodland failed to bring drier ground. I checked the map and made my way right to a walled enclosure with a house, where I hoped a path may be chanced upon. I found an awkward ditch beside the wall that proved a mare to walk in, but I figured I had avoided the worst of the spring in this area. I stumbled on, my direction dictated by what was accessible. A possible route through a tangle of bushes and trees often petered out or led into a pool of mud and moss that I dare not tread. It left me back tracking countless times, an exhausting business in rising temperatures. I had also been joined by a lot of flies, not of the plague proportions you encounter in the Australian bush, but more than I would expect of this island. They were obviously curious as to who this fool was in their neck of the woods! I could see a wall and fence ahead of me. There, to my right, on a corner of the fence, lay my prize; Rugglestone Rock. Later, when looking at the photo taken by Ken Ringwood, it was obvious he had visited out of the summer months and quite some time ago. 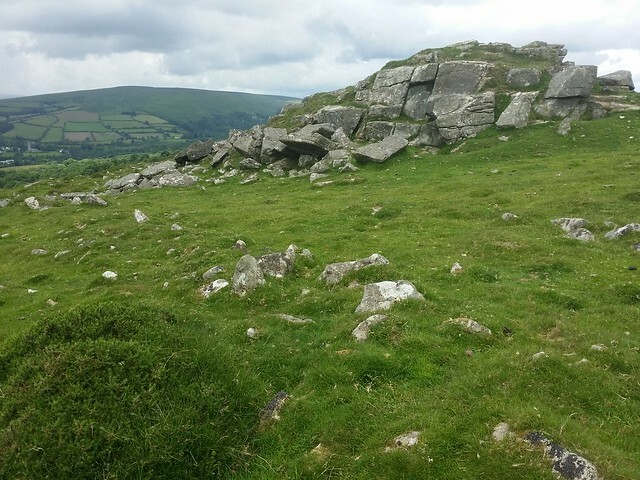 The outcrop is now only partially visible amongst the undergrowth. 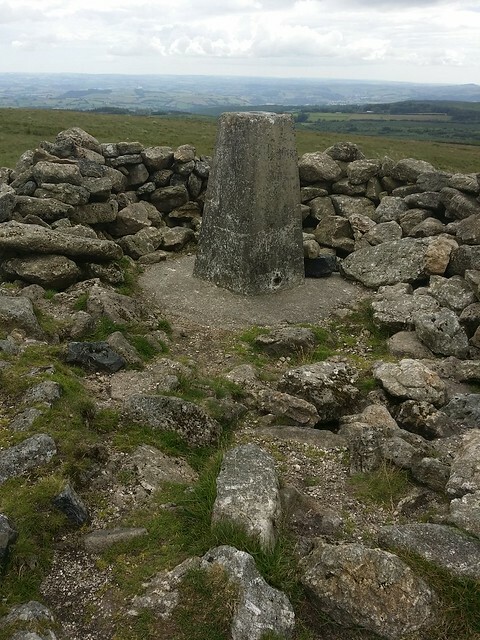 Relieved I had finally made it, and buoyed that I would never have to visit that bloody rock again, I began my way out of the mire, heading for a wall to the south, in the hope to handrail it east, south, then west and down to a road that lay below. Here I found some springs and a water course, making my intended route a daft one. The lack of a breeze in the sun, and those flies buzzing around my face continued this thoroughly unpleasant experience. I stooped through some woods, met with the dilemma of stepping onto sodden sphagnum moss or the black rotting trunks of fallen trees. 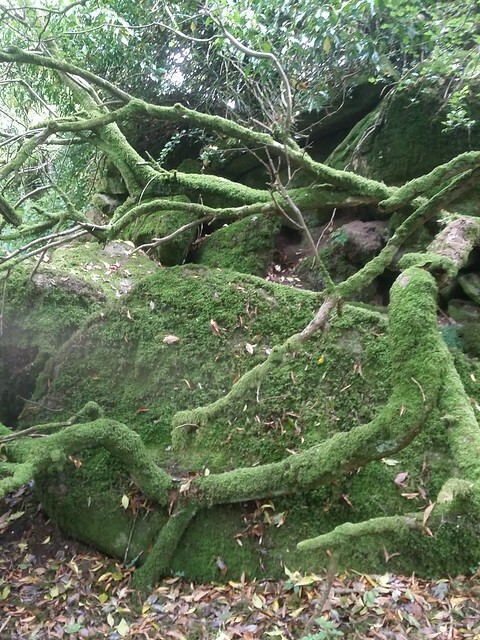 The first trunk crumbled beneath my foot and almost sent me tumbling so I went for the moss thereafter. At least three times I was in up to my shins and I cursed my decision to leave the gaiters in the car. That said, the exit was simpler than the entry, largely because all I was seeking was higher ground. 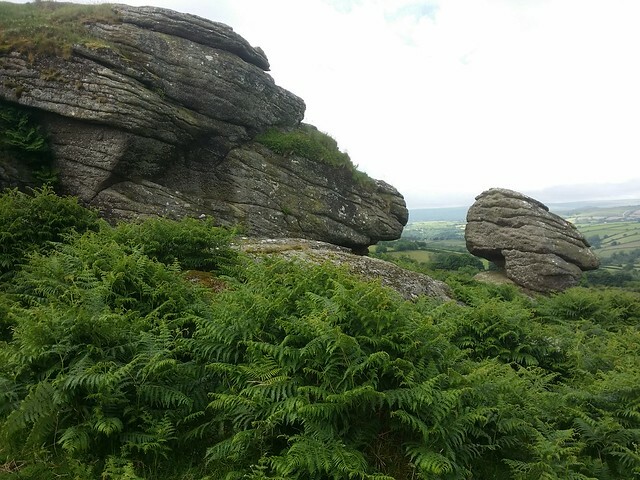 I was soon hopping over granite, the bracken was reappearing ahead, and I could see Tunhill Rocks waiting for my visit. I sat down for a breather by a small collection of boulders, faced into the returning breeze and went to survey my map to change my plan. Then it hit me; I'd dropped it somewhere in the mire below! The map and case I could have written off, but my home made laminated cards, crafted from Ken Ringwood's "Dartmoors Tors and Rocks" and a copy of Terry Bound's "The A to Z of Dartmoor Tors" I just couldn't leave behind. This one bag was taking a lot of my day and I was likely going to have to miss out on a couple later on if I took much longer. But I had to retrace my steps, if that were at all possible, back into the trees. I recalled the last time I looked at the map; I had stopped near the walled enclosure enroute to Rugglestone Rock, so I knew that was where I should start. Using my GPS, I followed my route carefully. I even repeated some, but not all, of the wrong decisions through the woodland, in case that was where I had lost my belongings. I happened across Rugglestone quicker than I had expected and laying there before it, was my map case. I was very thankful that it had dropped here and not in those torturous woods! 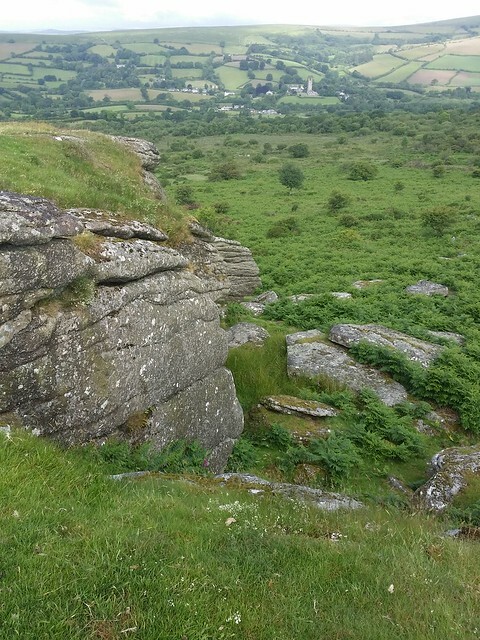 A return to Rugglestone Rock to retrieve my map! 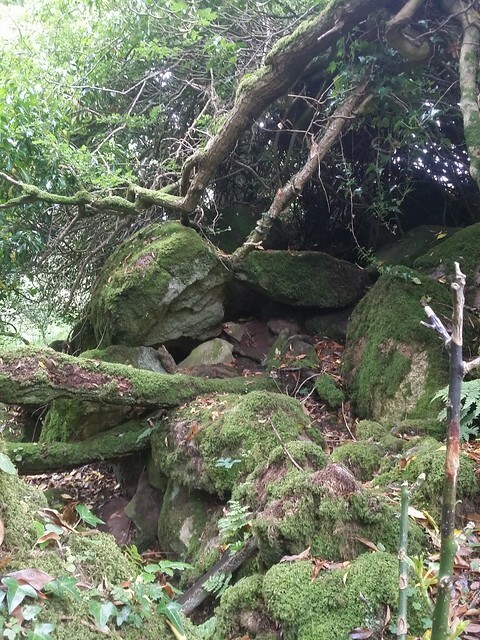 I returned to the boulders on higher ground, my footfall through the mire more assured having tackled it once. 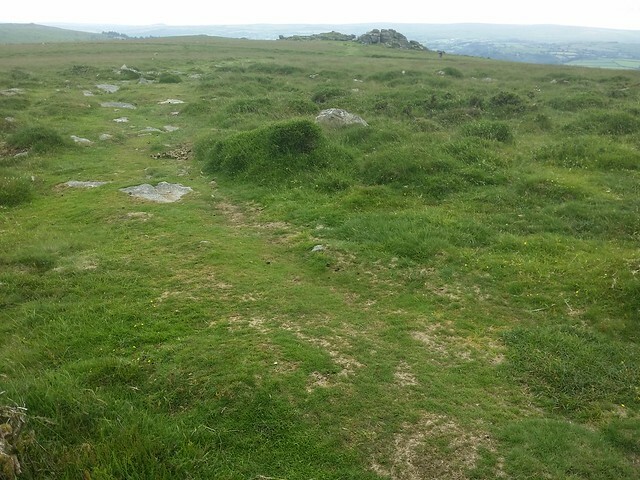 I wrote off the Open Access land to the road, not certain of a gate or stile at its edge. 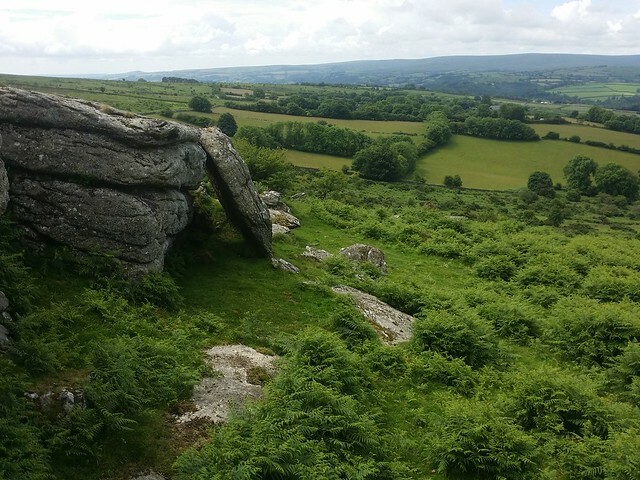 I also decided to forego Blackslade Rock and Scobitor, uncertain of the time it would take to bag them, or even if the latter would be possible, being on private land. Instead, I climbed up, passing Hollow Tor again, enroute to Tunhill Rocks. 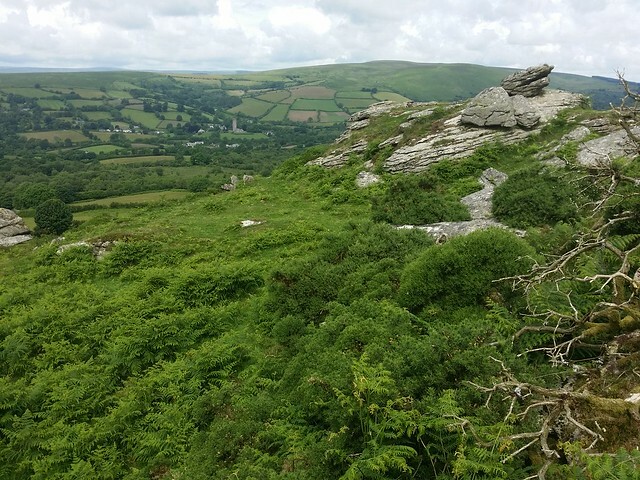 No official path to contour to the outcrop but an animal track through the waist high bracken eased the burden, as did the cooler air up here. I was very taken with Tunhill Rocks. 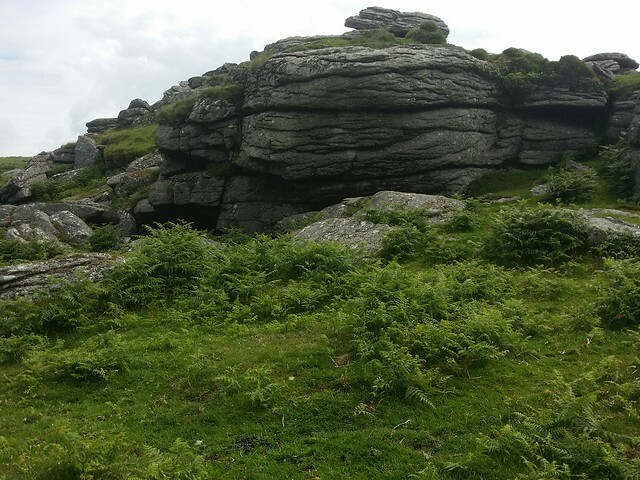 It possesses some long drops that climbers enjoy, but it is also easily clambered over by a simple hill walker without a head for heights. I hope the pictures do it justice! From Tunhill, I could see the road I had sought earlier. 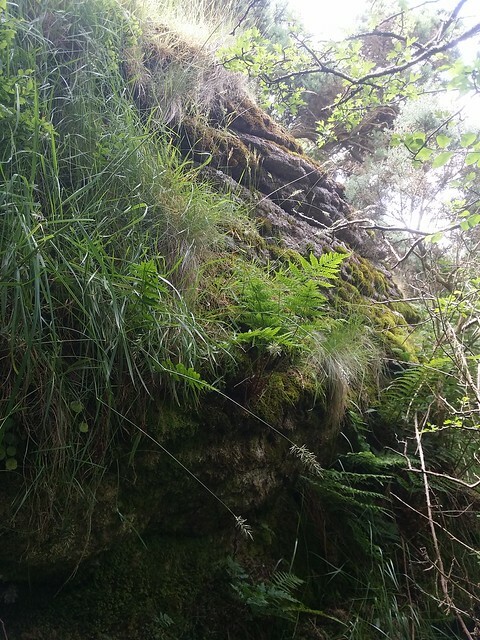 There was a grassy path leading to it, with a ladder stile. I changed my mind again and went for it. 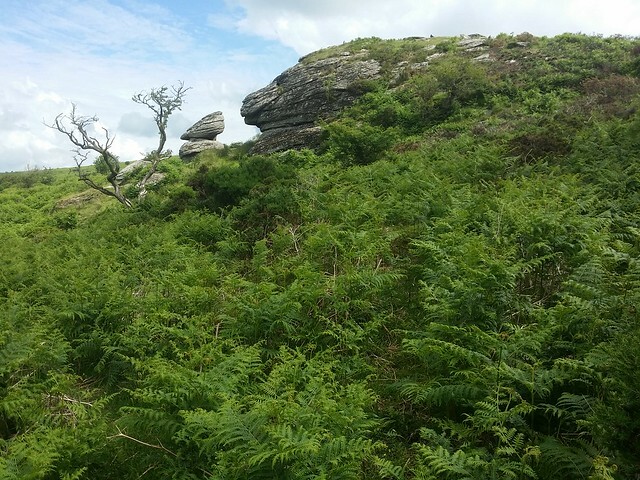 At the road, I turned right, down the hill, passed the entrance to Scobitor Farm, to seek out Blackslade Rock. 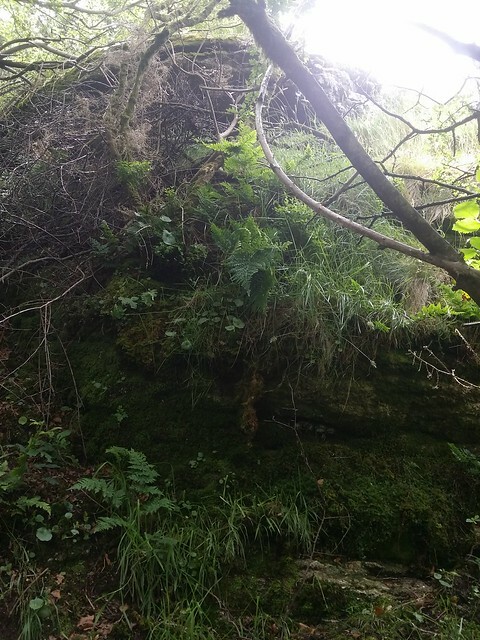 The only sign from the road of this outcrop is a small overgrown quarry on the right hand verge. You'll see a salt gritting bin placed here so you know you are at the right place, but you'll struggle to see any sign of a rock! 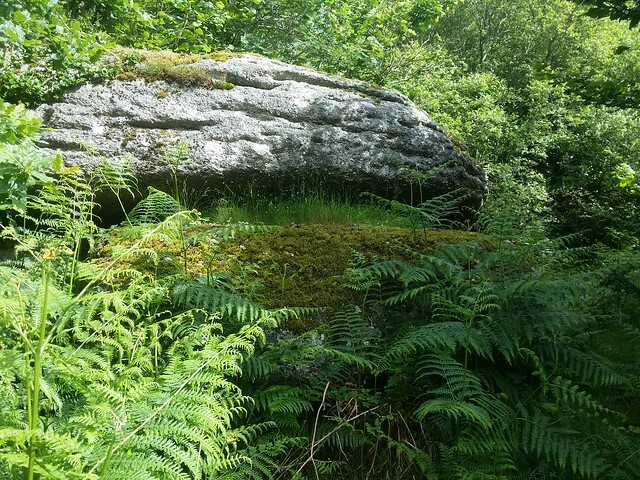 It entails some more squeezing through undergrowth to see any granite, but it is so inundated with foliage, it is impossible to get a decent photograph, let alone scale it. Now, on to the forbidden tor of the trip. Back up the road, I looked up the drive of Scobitor Farm in case I could see the owner and politely ask permission to visit, but the drive is long, trees hide the farm and it is an uninviting prospect to venture on it. So I rejoined some Open Access land, following the properties boundary wall south, then west. 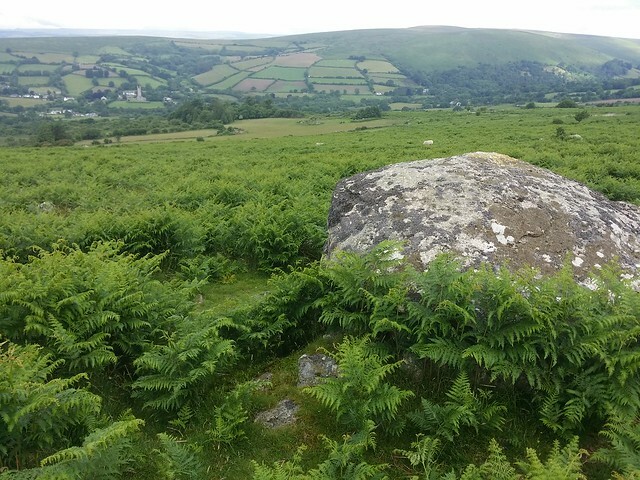 I came across a break in the trees where the tor could be seen, with a folly upon its summit, some four hundred metres away. I was encouraged by the woods to the south-east of Scobitor and went to see if a break in the wall existed. One did, the wall being in a state of disrepair. With no threatening "Keep Out" signs, I stepped into the cool and quiet of the walled woodland enclosure. I trod softly, avoiding fallen branches with the potential to snap loudly, drawing attention to my presence. 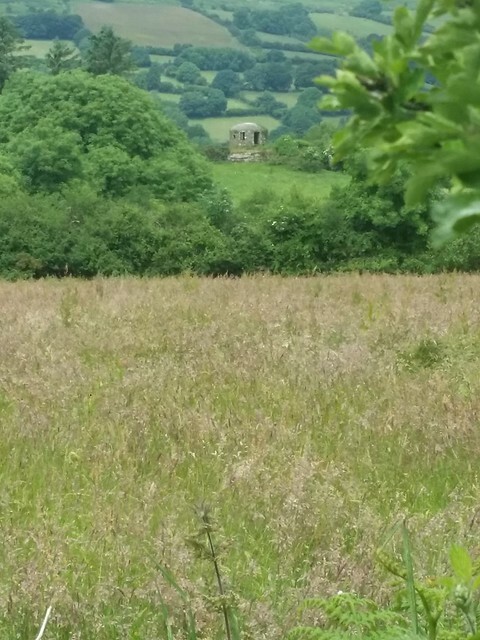 Through into another forgotten field, where a gate had once stood, I was among chest high bracken across the lower section, but I needed to get higher, very conscious of the proximity of the farm. I reached a final wall, with no where further to go, but spotted a jumbled pile of moss covered granite that I thought to be the bottom of Scobitor. I always realised that to visit the top would be impossible, being so close to the farmhouse and to do so would be an invasion of privacy, so I satisfied myself that I had bagged it. Back on access land, I returned to the place where I saw the folly and got a better picture of it. This listed building is a strange construction. 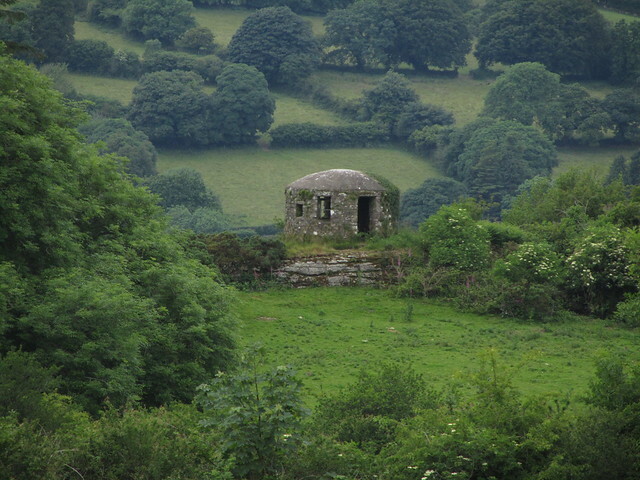 Resembling a world war two pill box, there are sources say that it was built as early as 1868. I returned to the road, and back along the permissive path to the ladder stile. I went east, up to Wittaburrow. 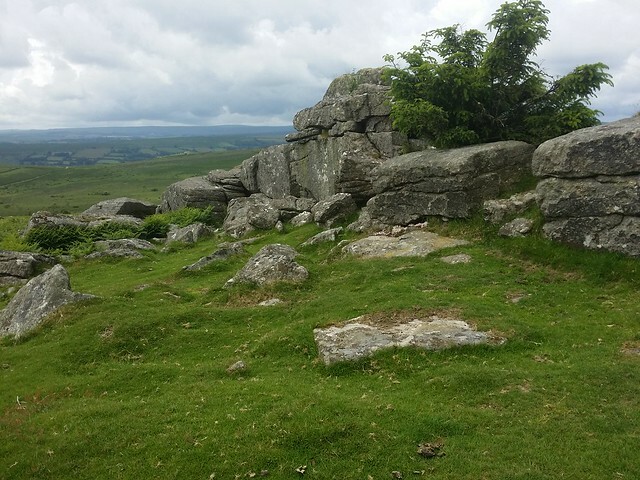 There are two outcrops here, the higher being the one I visited, being close to a large cairn. 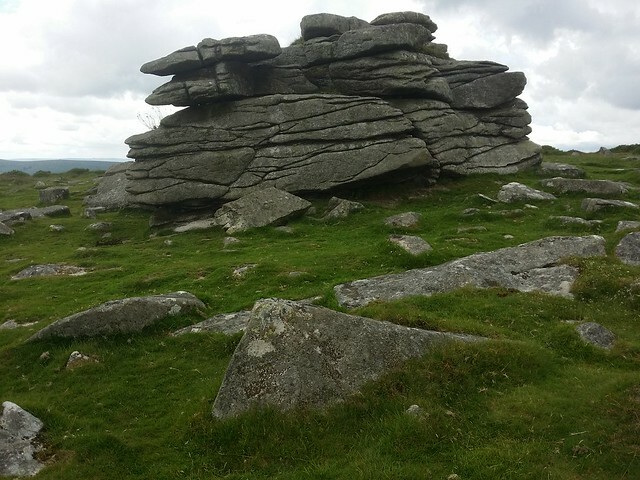 From the cairn, I checked my route to Rippon Tor, via Nut Cracker. I had plotted a walk along a well defined track, across Blackslade Ford, but my day had been long and I sought out a short cut; what sort of idiot would pick a short cut through an area named Blackslade Mire? Yet, there I was, labouring across a field of featherbed, teetering on clumps of long grass, my only refuge. Grateful to reach the road, I couldn't immediately find an entrance on the other side to ascend to Nut Cracker. 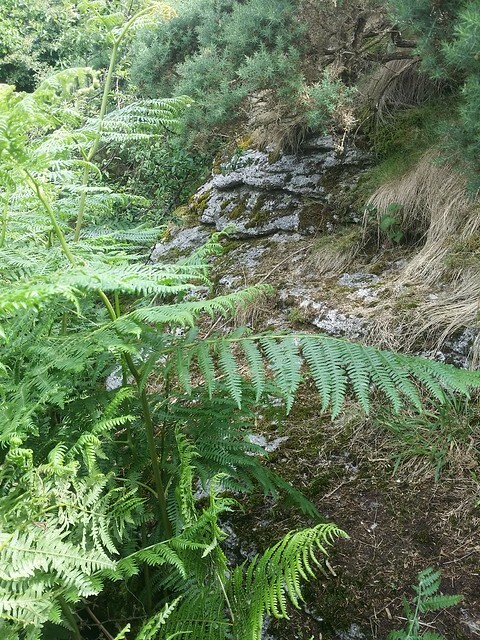 When I eventually did, I was in another mire for about fifty metres, easing as the gradient increased. Nut Cracker was reached and I took a break by the conifer tree that grows between. 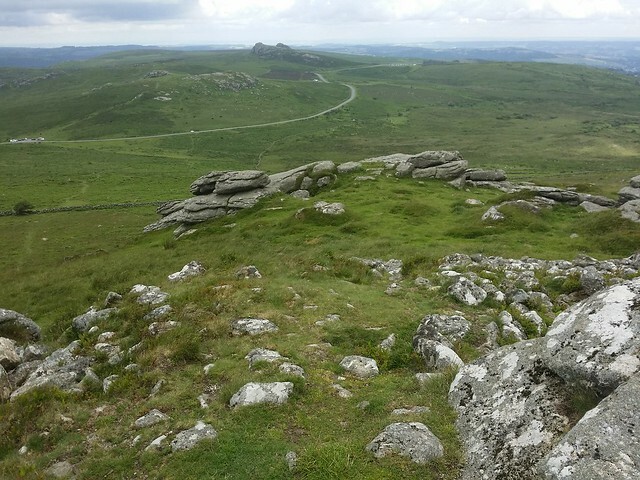 I was close to the end now, if you can call over three kilometres across Dartmoor "close". 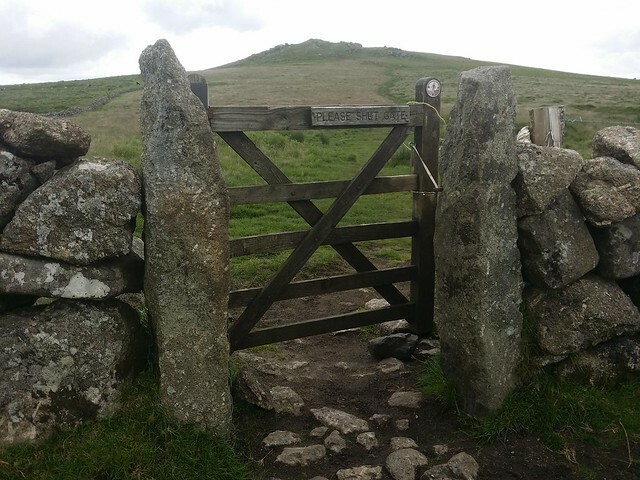 Through a gate, and up a path to Rippon Tor. 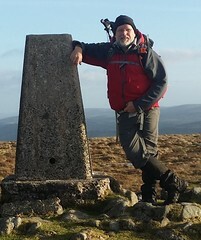 A large collection of granite outcrops with a trig pillar on the summit of this conical hill. I've been in the vicinity of this tor quite a few times, but this is the first time I had visited. 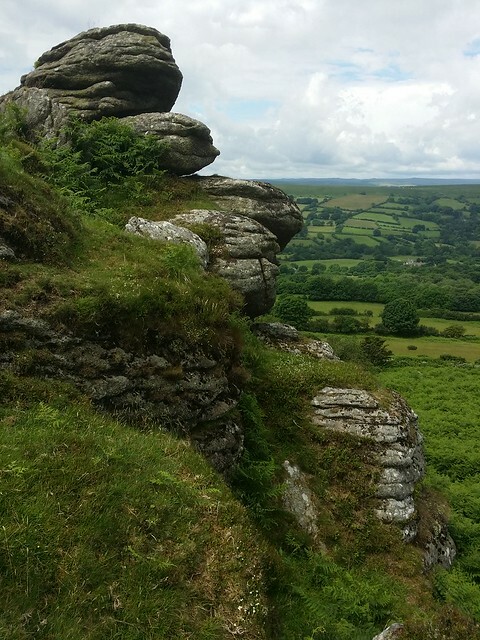 When I had walked down to the road, I couldn't resist getting my own version of the view that inspired the iconic Visit Dartmoor logo seen on their Facebook page here. Through Hemsworthy Gate, I climbed up to Top Tor. This consists of four main outcrops. I recall, from another trip here, it being a good vantage point to watch the setting sun, and being close to a car park, not much difficulty needed to get there. 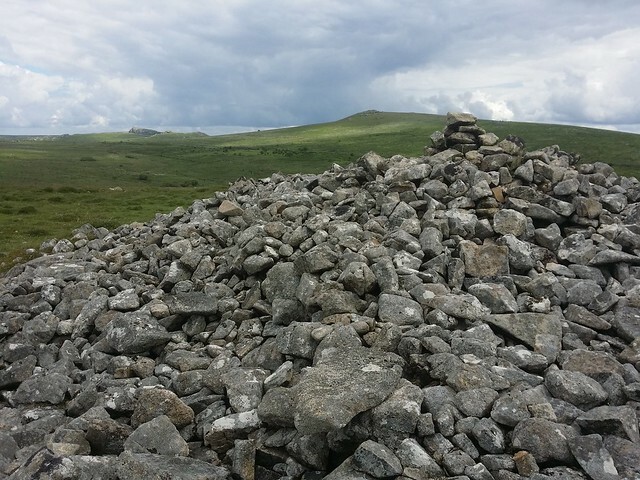 I turned left before the second stack at the top of the hill, to bag my final tor of the day; Pil Tor. It's proximity to the road would explain why this was the first tor of the day where I was not alone. There was a man and his child bouldering on one side, and on the other, a large group of about twenty ramblers sheltering from the wind. I waited until they had moved on before I took a few photographs.